First Taito took us on a ride through space with their cult hit Space Invaders. Now they are taking us on a ride through a vivid world of beautifully crafted visualisations and musical composisions. Ladies and gentlemen, please keep all body parts within the cart, the Groove Coaster is about to start. As a tap based rhythm game for both the iPad and iPhone, Groove Coaster might on the surface appear to have a range of simple mechanics. At its core, it does. 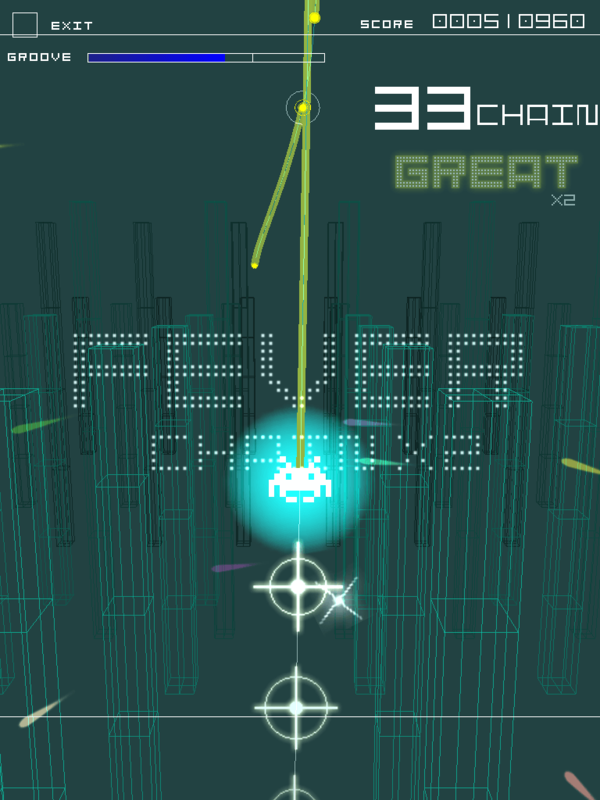 But there is a lot more going on than just tapping the screen as your avatar dances its way across a track. Tapping, flicking, and even scratching your screen in time to the music, as you ride along the Groove Coaster makes for a rather difficult game. The levels progress in difficulty, with the highest currently at 8. There is also the option to play different levels within the level, ranging from easy to hard, in an attempt to gain that perfect “S” rating on all levels. While this is extremely difficult to obtain, even on some of the levels deemed “normal” in difficulty, I think this makes the game much more enjoyable and gives a much needed level of motivation to the game. While a game structure like this is in danger of becoming very repetitive quickly, both the soundtrack and the graphics remedy this by working together to create a unique audio and visual experience every time you play. Generally audio tends to get lost in the way of graphics, especially on iOS games. I often find myself writing, the audio complements the unique graphics. In short, I am very rarely blown away by the audio of a game. 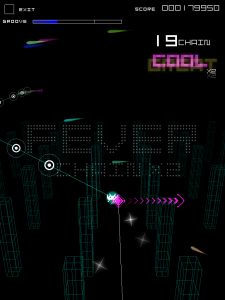 Even said “rhythm games” for iOS based devices, have left my ears wanting more. Groove Coaster has not only left my ears satisfied, but has done so to the extent that I am granting the audio its very own subtitle. Groove Coaster features an original soundtrack, that cant even be purchase on iTunes. Each track blends a range of stereotypical game musical elements, encompassing the bleeps of the 8-bit area, and pushing forward with rhythmic drum beats and heavy synthesisers. Even if you aren’t into this style of music, it’s hard to not nod a long and really get into the rhythm of the game. 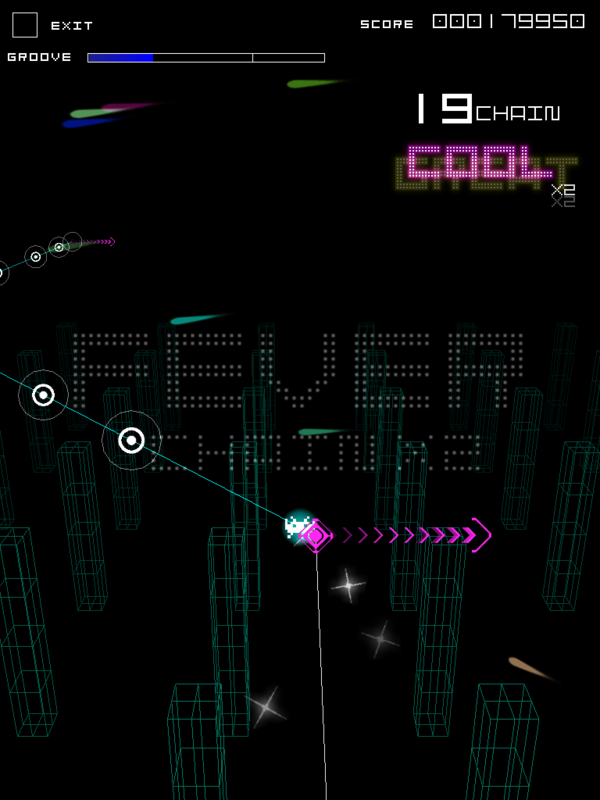 On top of the base track, players can also add to the song in their own unique ways. Firstly, if you miss a beat, it won’t be played. Although some avatars have the ability to play the notes without hitting them, generally if you fail to hit the beat on time the music will not play correctly. However, if you are rather good at the game, you can still add a little something extra. Throughout the levels there are hidden ad-lib notes which can be found by randomly tapping. At least it feels that way at first, as you get into the flow of the tracks, you can usually anticipate where the hidden notes will be, and play them in time for extra points. If there isn’t a hidden note, the game still responds with a little drum beat, which often at times sounds rather fitting. There is something slightly comforting about a little pixel-based character. Whether it’s just simple nostalgia, or an actual joy of seeing something beautifully created with minimal graphics, I can’t help but have a soft spot in my heart for little characters like the Space Invaders aliens. Groove Coaster not only bridges the gap between their iconic game characters, but lets you run across the bridge dancing, celebrating their latest game with fireworks, flowers and a plethora of other equally captivating visualisations along the way. The visulisations in Groove Coaster are nothing short of spectacular, and like the soundtrack, they are responsive to the players touch. While each level has its own unique graphical interface and design, there is also the option to alter these through upgradable skins. Skins alter the visual response to hitting a note correctly. Mixing up the skins creates a unique gaming experience every time you play. The more levels you complete, and the higher you level up, the more skins that become available to you. 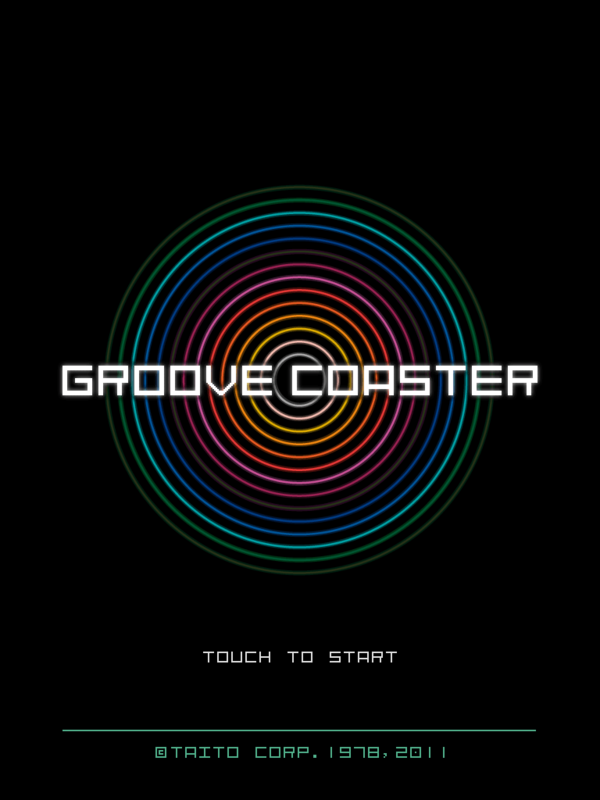 All up, there are 16 skins to collect and customise your Groove Coaster experience with. As well as 13 different avatars to collect and play with. Avatars range from small dots, to Space Invader aliens and ships, all the way to upgradeable avatars such as a goldfish or even a human. Each have their own unique ability that add to the game, for example Crab Version 2 lessens the strict timing required to hit a “Good” rating on a note. 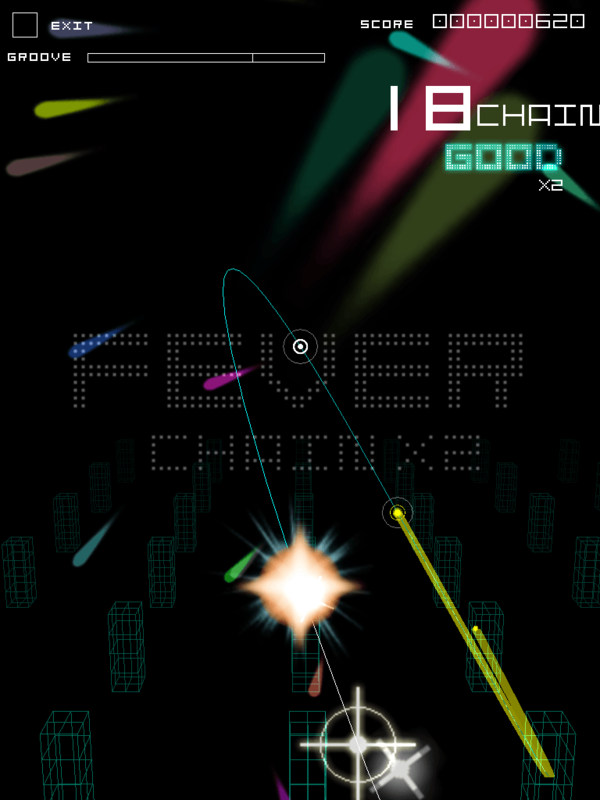 While they are more of a gameplay feature, I think their implementation as graphics really adds a touch of minimalism to the vivid and fluxuating game world that is Groove Coaster.